U.S. 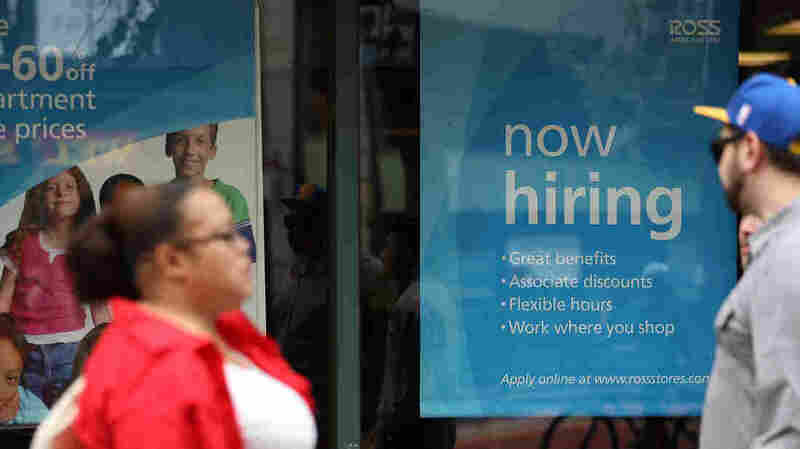 Adds More Than 250,000 New Jobs In July; Unemployment Steady : The Two-Way The Bureau of Labor Statistics' report shows stronger job growth than economists had been expecting. 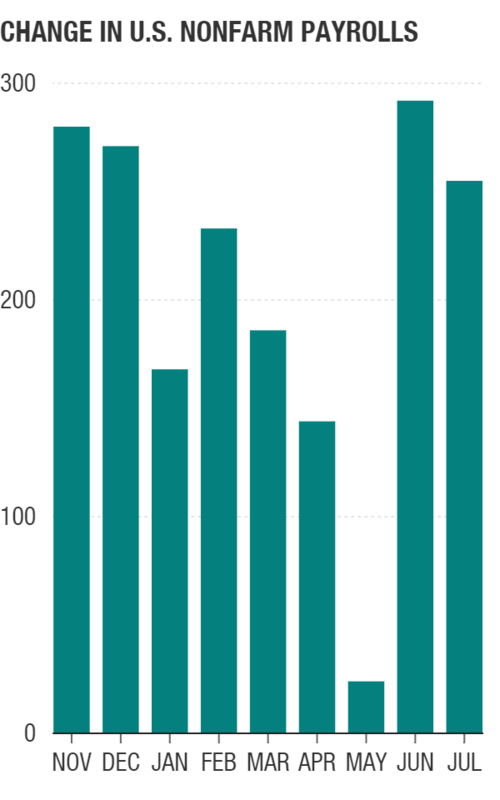 Meanwhile, NPR's Yuki Noguchi puts the very idea of a monthly jobs report in perspective. A "'now hiring" sign is posted outside of a Ross Dress for Less store on July 8 in San Francisco. The U.S. added 255,000 jobs in July, according to the monthly report from the Bureau of Labor Statistics; economists had been expecting about 180,000 new jobs. It's the second month in a row showing job growth significantly stronger than anticipated. The unemployment rate is holding steady at 4.9 percent, and the labor force participation rate ticked up slightly, from 62.7 to 62.8 percent. Average hourly earnings are up 0.3 percent. But June was strong, with nearly 300,000 new jobs added: that number has been revised upward, from 287,000 to 292,000. Between the boost in new jobs and the revisions to the last two months, the report is significantly stronger than had been anticipated. Professional and business services saw the greatest job growth; the industry as a whole has added more than half a million jobs over the last year, the BLS says. Health care, financial activities, leisure and hospitality also saw growth, as did government employment. The mining industry continues to lose jobs, but other industries are holding more or less steady, the BLS says. On Morning Edition, NPR's Yuki Noguchi reported that the numbers on each month's jobs report ought to be taken with a grain of salt. Alan Blinder, a former vice-chairman of the Federal Reserve, tells Yuki that every month, about 5 million jobs get destroyed and about 5 million get created. That churn helps the economy grow, as successful companies expand and unproductive ones shrink, Andrew Chamberlain, the chief economist for Glassdoor.com, says. But it means the monthly jobs numbers don't have much impact on people's lives, he says. "When job numbers go fluctuate by a hundred thousand — in the scheme of things, that's not much," Yuki says. The long-term numbers, looking at a year instead of a month at a time, are more significant. But the jobs report is the best available snapshot of the labor market at a given time, and they might have psychological value — especially significant in an election year. "If the report affects how people feel about the economy," Yuki says, "it might affect how they vote." A previous version of this post incorrectly identified Andrew Chamberlain as Alan Chamberlain.